Premium quality household pressure pump and pressure controller. Self-priming Technopolymer jet assisted pressure systems with constant flow and loss of prime protection. AS/NZS4020 approved for drinking water ideal for small to medium Dwelling (home) applications. .60 kW, 6 taps, peak flows up to 60 LPM, up to 46 m of head pressure. Note: This is the same pump as the “Rainsaver DAB Jetcom 82 Pack with Controller” however it does not include the Rainsaver changeover controller. 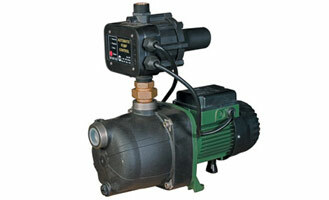 It’s a pressure controlled pump, without the mains change over controller.